Great for brunch, lunch or dinner with a glass of bubbly! 1. Break the eggs into a large sealable ‘clip lock’ Glad Bag and the rest of the ingredients, seal the bag and shake thoroughly until mixed. 2. Place the bag in a pot of boiling water and cook until eggs are no longer runny. 3. 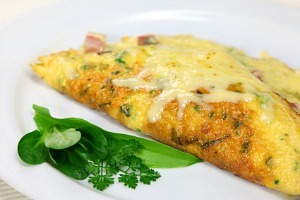 Open the bag and pop omelette onto a plate – voila!